【Good-looking Appearance】: Multi-functional A4 portfolio is simple and generous in appearance,leaving a great impression on clients or others. 【2 Ways of Charging】: Built-in 8000mAh rechargeable power bank and charging cable, support charging for iOS/Android Phone(Micro USB). It also support wireless charging, it requires mobile phones with wireless charging function. 【Intimate Design for You】: A pen loop is convenient to carry pen to record any time, comes with refillable writing pad. Zippered enclosure ensures security and safety. The portfolio with cellphone stand function. 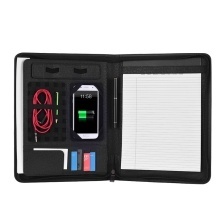 【Multi-functional Storage】: Can store earphones, data lines, name cards, credit cards, documents, files, pens, cellphones, money, U disk, etc. A portfolio can keep everything in order, improve your work efficiency. 【Wide Application】: Perfect for business persons, managers, students, teachers, salesmen and lawyers, etc. Suitable for travel, office, learning. 【Great PU Leather】: High-quality PU leather material, comfortable holding and exquisite workmanship. The item only includes the portfolio and writing pad. It can charge two mobile phones at the same time. If the mobile phone does not have wireless charging function, it needs a wireless charging receiver.